This shielded power cable consists of four twisted pairs of conductors (shielded twisted pair) for building computer networks. Contains shielding to minimise electromagnetic interference from the environment, so it is ideal for demanding environments with strong interference. For shipping to other EU countries visit this page Datacom, shielded (twisted pair), CAT5E, FTP, 305m/box. 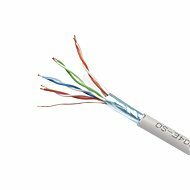 Für Versand nach Deutschland, besuchen Sie bitte Netzkabel Litze CAT5E FTP, 305 m/Box. Chcete doručit zboží do Česka? 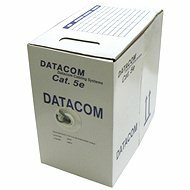 Prohlédněte si Datacom licna (lanko), CAT5E, FTP, 305m/box. Chcete doručiť tovar na Slovensko? 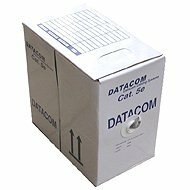 Prezrite si Datacom, licna (lanko), CAT5E, FTP, 305 m/box. Für Versand nach Österreich, besuchen Sie bitte Netzkabel Litze CAT5E FTP, 305 m/Box. Magyarországra történő kiszállításért tekintse meg ezt a termékoldalt: Datacom, sodort, CAT5E, FTP, 305 m/doboz.